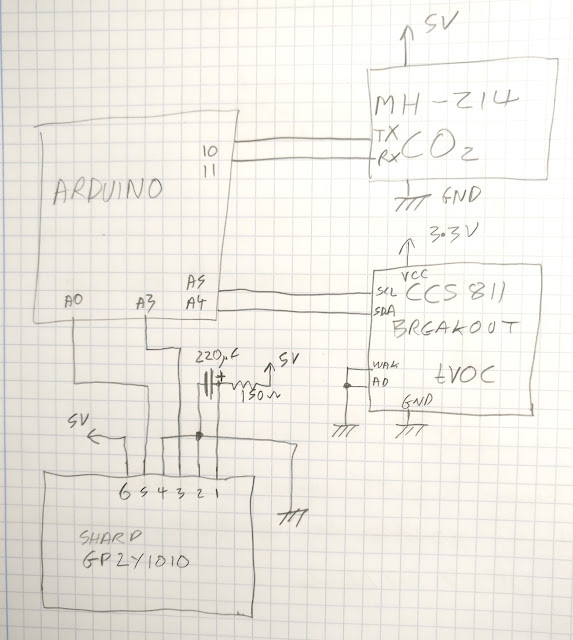 I've recently spent some time developing the MonkMakes CO2 Sensor for micro:bit and have spent a fair amount of time researching into indoor air quality. It struck me that I actually had no idea how healthy (or otherwise) the air is, in the house that I both sleep and work in. Time for a project! What's more I can reuse some of the sensors that I have accumulated while researching. These are low cost sensors, the whole lot costing probably less that GBP 50 (USD 50). eCO2 - equivalent CO2 (derived from the tVOC sensor by the CCS811. 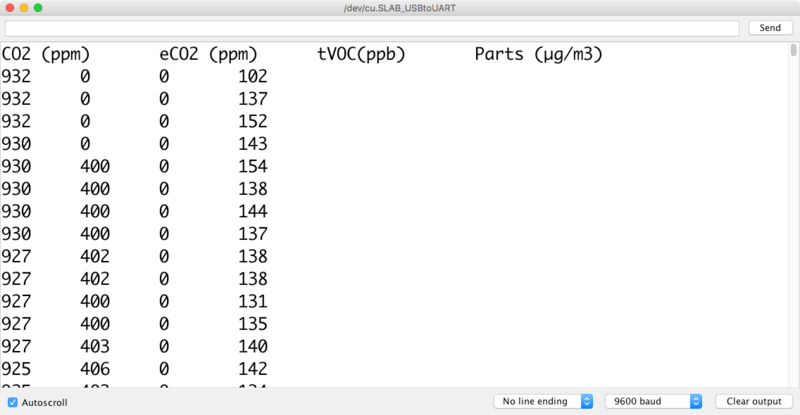 You don't need these readings if you have real CO2 measurement, but I wanted them for comparison. 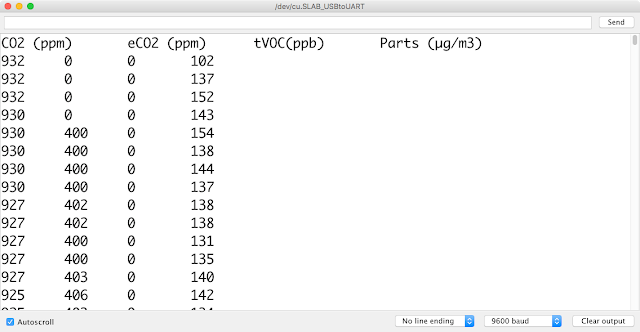 Particulates - µg/cubic metre - this was measured using a Sharp GP2Y1010 optical particulate sensor. 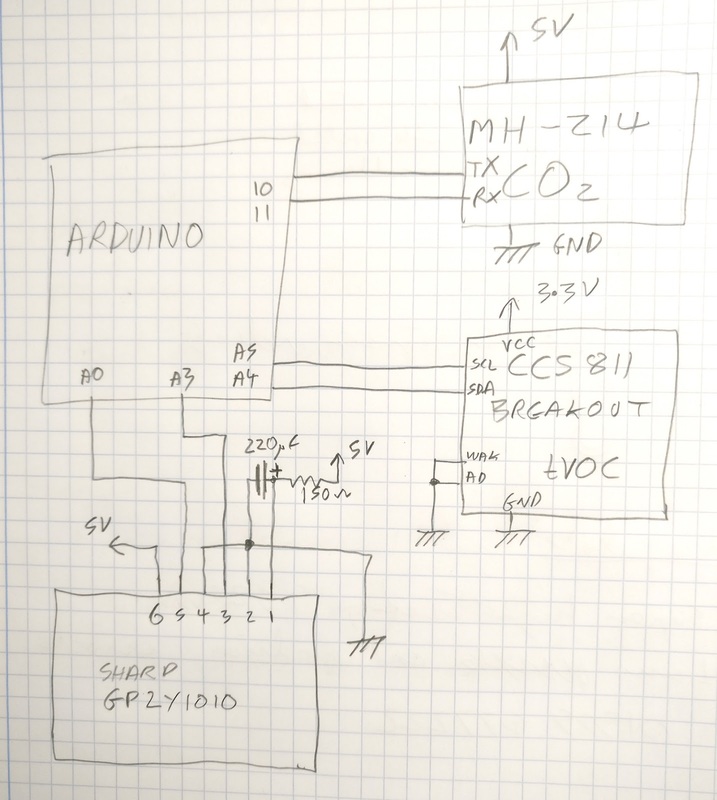 It all squeezed onto a breadboard and I used a MonkMakesDuino Uno compatible as the 'Arduino'. The sensor uses spectral absorption to optically measure the CO2 compensation. No compensation is made for temperature (indoor use, so stable temp assumed) or altitude (atmospheric pressure - but this is a small factor). This air-quality sensor chip measure Total Volatile Organic Compounds (unhealthy chemicals with a boiling point that makes them likely to get into our air). We breathe these out and they are also found from pollutants and chemicals we use in our lives. There are not many of them in good clean outdoor air - in most places anyway. Here's the schematic for the project. Here's the sketch. I've added lots of comments. Between the comments and the datasheets, it should make sense. You will need to add the Sparkfun library to your IDE, before it will compile. long lastSampleTime = 0; // more accurately when data was last logged to serial. You can find information on healthy levels of CO2 here. For information on tVOC concentration and what it means, see here. So will the tVOC sensor indicate unburnt hydrocarbons (from vehicles) in an outdoor air sniffing situation?